ISAPI Filter ‘C:\WINDOWS\Microsoft.NET\Framework\v2.0.50727\aspnet_filter.dll’ could not be loaded due to a configuration problem. The current configuration only supports loading images built for a AMD64 processor architecture. The data field contains the error number. To learn more about this issue, including how to troubleshooting this kind of processor architecture mismatch error, see http://go.microsoft.com/fwlink/?LinkId=29349. Basically, you (or the software you were installing) switched your IIS site where OWA is installed into either a 32bit mode or ASP.NET 1.1. Since Exchange 2007 Outlook Web Access 2007 only runs on ASP.NET 2.0 in 64bit mode, you need to fix it back. Restart IIS and you should be all set. Remember, you have to be careful with third party software deployments and IIS on the 64bit platform. Before you do your rollouts create the web site for it, put it in its own worker group. If you allow it to do its own deployment it will usually go into the Default Web Site, DefaultAppPool and you’ll be reading this blog post again. Also remember that just because the software says it’s 64bit it doesn’t mean all the components of it (like web control panels) are 64bit as well. In this case, it was Symantec AV that did it. Let’s hope that in SBS 2008 the risk of this happening is diminished since we run OWA from our own web site (SBS Web Applications ). Pingback: Vlad Mazek - Vladville Blog » Blog Archive » How do you work this thing? Funny, I just ran into this same problem last week. I installed Quickbook 2006 on my server so I could run in multiuser mode. Quickbooks installed .net 1.1. It’s Server 2K3 R2 x64 and exchange 2007. The next morning, I was out on a job and tried to logon and had the same darn problem. After I figured out the same problem… my solution… restore the metabase.xml file. Problem solved! Worst part about this is that this very same thing bit me 8 months ago… and I forgot and went and did it again! ARggh.. I had the same problem again. The client called at 9:30 PM.. Checked the logs, no apparant issues. So I went and did the fix anyway. Problem went away. So the question that I had is why the logs were not showing the problem. I finally found the answer.. the problem had occured at 5:10 AM; 16 hours earlier! It was easy to find the log entry when I knew what event to look for. OWA had not worked all day, but they did not complain. If the client had complained earlier in the day, I might have found the log entry earlier. That is why I did not find the log entry the first time, I did not go back in the logs far enough. Live and learn..
Pingback: Vlad Mazek - Vladville Blog » Blog Archive » Here you go.. Thanks! Same thing happened to me this morning and this really helped! Thanks a ton for valuable solution. It works and actually solve my problem. Your awesome! Thanks. Worked like a charm. I got hit by this from Symantec AV too! I’m thanksfull for your online resourse! was my life saver, at 3 am we were lost and clueless. Microsoft were recomending completely different solution and guess what…. it didnt work. Thank you so much for sharing such valuable experince. BTW tis problem affecting not only OWA. Active Sync gets affected as well. I had a fresh install of Exch2007 with a new cert, so I had a lot of variables and it never worked from the first time I checked it. Hmmm…I followed your steps and was able to get OWA from a 503 to a 404. Guess I’ll keep googling until I get it down to a 200. Thanks for this part of it, though. Ok, in case anyone else ends up with a 404 after doing this, go into IIS Manager’s Web Service Extensions list and allow ASP.NET v. 2.0.50727. Thanks again for this article. Thnkas very much. Installed Trendmicro on a 64 bit server and it killed all the websites. This worked great. Thanks very much. Installed Trendmicro on a 64 bit server and it killed all the websites. This worked great. You are right. You do deserve a raise. As you are aware today is the last day of the year and I was upgrading the exchange server to 2007 at my office. Everything went alright but this error kept on bugging me. After following your steps, it work so would like to thank you. Keep doing the good work. Thanks for helping out. I installed Blackberry Server Software on our Exchange Server and kept getting Service Unavailable Error. This worked like a charm. Thank you very much. This worked like a charm. 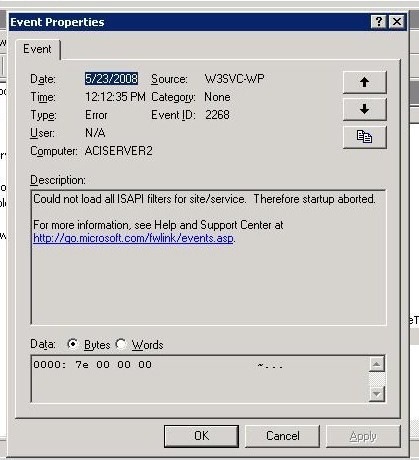 One of our admins tried to install BES on the Exchange 2007 server and it broke OWA and Outlook Anywhere. Same problem, but mine happened after installing Symantec Endpoint Protection Manager + SMSFME. I tried this post, among others, and NONE are working. Everything IIS related shows (service unavailable). I have uninstalled/re-installed IIS 6.0 and STILL have the problem. Symantec is offering no support because OWA/IIS is not their product. I have a single server, 2003 Standard x64 w/ SP2, Exchange 2007 SP1 x64, etc. OWA was working fine before the install (90% of my users use OWA), and now it is not working. I even uninstalled SEP + SMSFME and the problem will not go away. I think the next step will be to re-install .net, but i dont want to create more issues. That worked like a charm, in my case someone installed vmserver on my exchange box. You are a life saver saved me alot of time, now I can leave early for the weekend. Thanks again! Thank you very much.I find good tips for the Exchange 2007, OWA 2007.